how accurate a "given" light source is at rendering color when compared to a "reference" light source. used for tasks requiring the most accurate color discrimination. Cuttable and Linkable: It can be cut every 3 LEDs per 2inch(5cm) along the cutting marks, without damaging the rest strips. CRI90+ offers exceptional color consistency and color rendering index, show natural colors more vibrantly. 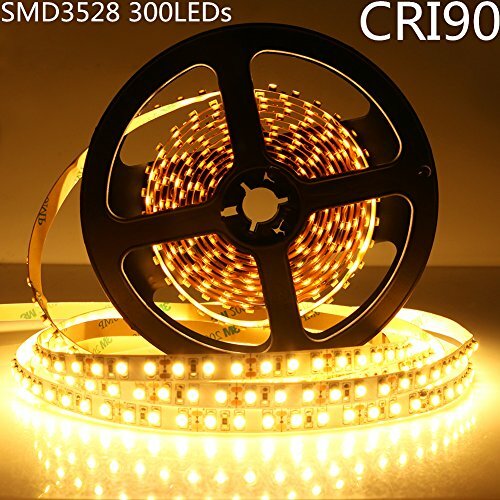 Safe to use: SMD3528-300LEDs, DC12V 24W 2Amp, 16.4 Feet (5 Meter) Roll. High intensity and definite reliability. Extremely low heat. It is touchable and safe to children. Reduce re-lamp frequency: Double layer PCB, copper wire gold support LED component, more reliable and less brightness depreciation. Lifespan is over 50000 hrs. Save effort and maintenance costs on changing lights frequently. Easy Installation: 8mm wide white PCB background with double-sided adhesive tape backing. With DC female terminal end adapter, it can be able to plug in any transformer/dimmer. A power adpter is required but not included.Please search "LightingWill adapter B01DM7HB9K" if you need one. Wide application: Very suitable for indoor and outdoor lighting and decor. Such as kitchen, under cabinet, dining room, bedroom, garden, patio, balcony, party, wedding etc. Manufacturer: ShenZhen HuaKe Light Electronics Co., Ltd. Publisher: ShenZhen HuaKe Light Electronics Co., Ltd. Studio: ShenZhen HuaKe Light Electronics Co., Ltd.
View More In Low-Voltage Transformers. If you have any questions about this product by LightingWill, contact us by completing and submitting the form below. If you are looking for a specif part number, please include it with your message.